Wisconsin Sports Tap: Should Pack deal Kampman? It's not a very complicated proposition. The Green Bay Packers have too many Linebackers, and an underwhelming Offensive Line. Aaron Kampman is a Defensive Lineman playing out of position at outside linebacker and has yet to provide any noticeable pass rush in the first two games of the season. See where I'm going with this yet? Don't get me wrong, I think Kampman is a tremendous defensive end and a potential game changer in a defense that let's him use his skills. The fact remains though, that the Dom Capers 3-4 defense is not one that suits said skills. At 6'4" and 260 lbs. Kampman is a dominant end in a 4-3 setting, but lacks the speed to play coverage in the 3-4 and size to play end. It's not feasible to expect the same type of production out of him that Packer fans are accustomed to. So why not shop him around? I'm of the opinion that Kampman will be dealt, most likely in the offseason, to a team that will allow him to play to his full potential. The question becomes, why wait? 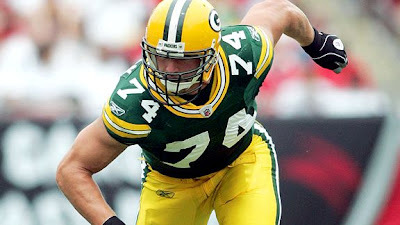 Surely there is some team that is willing to deal a player or two to help Green Bay's O-line or a team desperate enough to deal a very high draft pick (or two) for a player of his caliber. If Richard Seymour can fetch a first round pick, than just imagine what Kampman's value would be. One concern may be that if a trade were to happen it's not likely that Green Bay would receive an impact tackle. It's too early in the season for teams to think they don't have any chance (except maybe the Lions, and don't expect that to happen). So the players that could really help the team likely won't be available in time to help. So the questions begin, should Kampman get the full season to see whether or not he can be an effective pass-rusher in the 3-4? Especially when their are talented players behind him that deserve more playing time? Another concern would be that, as Kampman struggles in the the new scheme and gets a year older, does his trade value diminish any? What would trading Kampman do to the Packers defense? Well, it's been said that Brandon Chillar can play at any linebacker spot so a new linebacker rotation could find more playing time for Nick Barnett, a former pro-bowler who is an undeniable talent. Also it would free up more plays for rookie Clay Matthews, as well as pre-season playmaker Desmond Bishop and the ever rock-solid Brady Poppinga. It's a nice problem to have too much talent at any given position, and it's a problem the Packers face now. Let's face the facts though, Kampman is a square peg in a round hole. Another concern is that Kampman is a free agent at the end of the year, so even if a trade is made deeper into the season, a starting caliber offensive lineman still won't be on the table from a contender who is essentially looking to rent him for the year. Still, I think you're right. Kampman isn't a game changer in this defense and trading him for anything would allow more playing time for those better suited for his position. Its a move that should be made.